Abstract: In present-day Croatian there is quite a large discrepancy between the actual usage of numerals and their description in major normative works. This discrepancy seems to be most present in the case of collective numerals, which are normally described as quantifiers for the elements making up a group of mixed gender. The actual usage of many instances of declensions and agreement of collective numerals often remains unexplained. In the clas- sic Hrvatska gramatika (Barić et al. 2005: 219), for example, seven different forms are given for the dative as well as the locative case and four different forms for the genitive. When or how exactly a specific form is used remains unclear. Most Croatian grammars pay very little attention to the agreement of collec- tive numerals and give only nominal agreement in the genitive and some re- marks on possible verbal agreement in the singular and the plural. Conditions for the choice between the alternatives are generally not discussed. This paper attempts to distinguish between the morphological and semantic principles of classification. Furthermore, it describes and discusses the declension, distri- bution, and agreement of collective numerals in present-day spoken Croatian. This is done without adopting a theoretical stance: this study is limited to the comparison of the treatment of collective numerals in different grammars, and the investigation of the extent to which this treatment reflects the actual usage as found in hits sampled from the Internet and the Croatian National Corpus (HNK). Abstract: Since the enlargement of the European Union beginning in 2004, there has been a huge wave of migration to the United Kingdom from Poland. The UK, unlike other EU countries, allowed full access to its labor market to nationals of eight accession countries, including Poland. The diaspora formed new communities and a new contact variety emerged among them, common- ly referred to as “Ponglish.” Although Ponglish has enjoyed some attention within linguistics, the humorous, “technically incorrect” literal translations of Polish words and phrases into English, usually by Poles with a rather high proficiency in English, have remained unexamined to date. This article ana- lyzes the phenomenon of literal translations in Ponglish in detail, based on a number of websites dedicated to the subject, and attempts a classification. 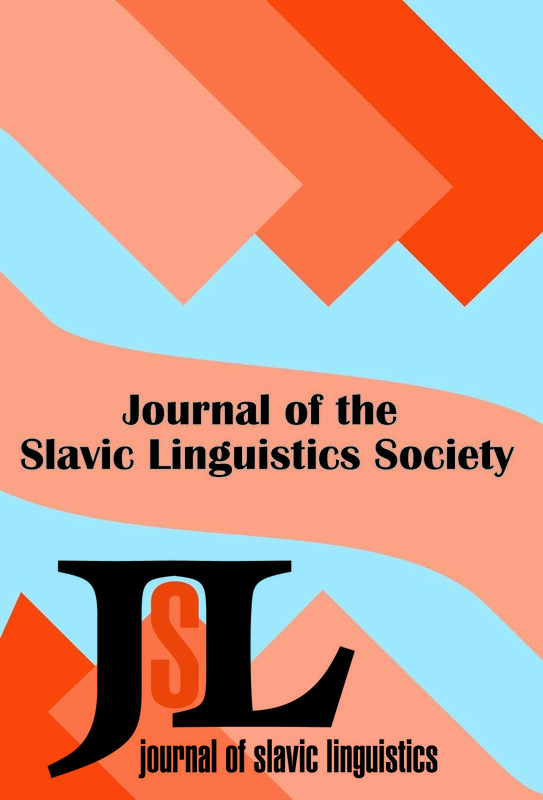 Abstract: This study examines the Bulgarian motion verb system in terms of what information is typically conveyed by motion verbs in addition to motion itself. The theoretical framework is Talmy’s (1985) typological theory, which divides languages into low-manner verb-framed languages and high-manner satellite-framed languages according to what additional information is typi- cally conflated with motion in a motion event. Bulgarian motion verbs empha- size path of motion to a greater extent than do most other (non-Balkan) Slav- ic languages. Non-Balkan Slavic languages more often use verbs of motion expressing manner in combination with (satellite) prefixes indicating path, while Bulgarian focuses on verbs which express the path of motion, some of which are Bulgarian innovations. These verbs are often prefixed, but the pre- fixes may be fused to the root to the extent that an unprefixed form of the verb does not occur, and prefixation here is no longer productive. Typical examples include the frequent use of the path verb izljaza ‘to exit, go out’ when speakers could also use izletja ‘to fly out’ or izmâkna ‘to sneak out’. This variation in the Bulgarian motion verb system brings Bulgarian closer to the other Balkan languages (especially Greek, with its parallel motion event conflation), and is viewed here as a possible instance of Balkan Sprachbund influence. Abstract: The question as to how many genders there are in Polish has ab- sorbed linguists for well over half a century. Almost everyone approaching this question has applied a different criterion to the exclusion of other criteria in order to obtain an answer, and answers have ranged from every number from three though nine, or even more. One matter that has never been given due importance is the evidence of third-person pronouns which, in both nom- inative and accusative cases, would seem to have come into existence partly in order to be able to refer to nouns by their gender. All told, evidence points to the existence of four main Polish grammatical genders, consisting of the traditional three (masculine, feminine, neuter) and the Polish innovative one of “masculine personal.” These comprise a tightly knit coherent system. Other gender candidates can be considered to be either “subgenders” (masculine animate and masculine depreciative) or “quasi-genders,” of which there are around half a dozen. The existence and behaviors of the quasi-genders, i.e., nouns that would appear to belong to one gender but can act like another (an example being “facultative animate” nouns, i.e., referentially inanimate nouns that behave as if animate) shows that users of the language remain sen- sitive to mismatches between declension-type, gender, and sexual or animate reference, and will allow referential reality to assert itself against grammati- cal gender in accordance with Corbett’s observation as to the increasing insta- bility of agreement targets the farther they are from the agreement controller.